Extraordinary Cappadocian landscape and the lush valley where you spent the previous night camped in circular tents in an apple orchard, eating vegetable stew beneath the stars. Above you, the arid plateau where ancient kings are buried, their tombs marked by mounds of earth – the point where you’ll break, recharge with slices of melting chocolate cake, and gallop over grassy expanses under an azure sky. Something like a cross between the Grand Canyon and a moonscape, Cappadocia boasts some of the worlds most unusual and spectacular landscapes. Traversing the countless valleys and mountains by horseback brings riders in touch with the area’s breath-taking beauty. 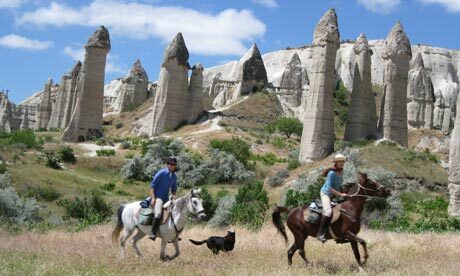 Forget the tour buses or even the rental cars – this astonishing region of Central Anatolia is truly best seen by horseback. 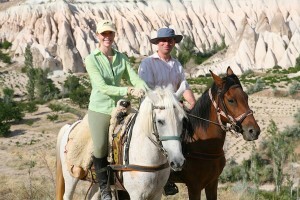 If you interest remarkable horseback riding, please join us and we take you unique riding experience in beautiful Cappadocia.